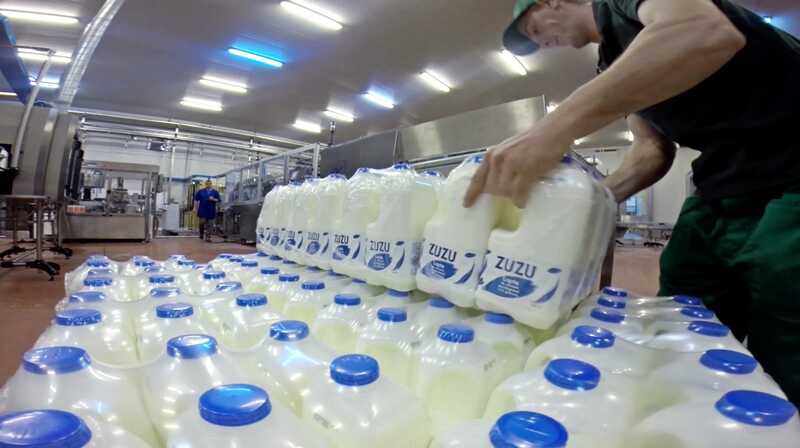 The raw milk entering the Albalact factory is collected from farms which are certified to produce and deliver milk in accordance with the European Union norms. When entering the factory and before being unloaded from the transport tanks into the reception tanks, the milk is quickly analyzed in the lab to determine several microbiological and quality parameters (antibiotic, aflatoxin, total number of germs, proteins, fat, acidity, etc.). If the milk does not meet these parameters, it is not received at the factory. With the help of state-of-the-art technology, the entire processing system in the Albalact factory - tanks, pasteurizers, sterilizers, yoghurt preparation and packaging equipment, equipment for the preparation and packaging of pasteurized and UHT milk - is fully automated. The processing and control system was supplied by TetraPak, the international leader in this field. In order to ensure a seamless production process there are two control stations equipped with high performance computers which manage and supervise the entire production process, generating production lists, production reports and sanitization reports. With the help of state-of-the-art technology, the entire processing system in the Albalact factory - tanks, pasteurizers, sterilizers, yoghurt preparation and packaging equipment, equipment for the preparation and packaging of pasteurized and UHT milk - is fully automated. The processing and control system was supplied by TetraPak, the international leader in this field. The factory is completely automated and computerized, practically no employee ever touches or handles the raw milk or the processed products. Once the milk enters the factory, it doesn’t get into contact with air until the moment the consumer opens the box. The computers control and monitor all processing parameters in real-time - quality, quantity, temperature parameters - as well as packaging parameters. The washing and cleaning of the processing equipment is done by the CIP station, which is equipped with two washing units which do not allow washing solutions contaminated by raw milk to enter the pasteurized milk area. In the Albalact factory, milk is pasteurized or sterilized at high temperatures and processed in ultramodern equipment, in a closed, clean environment and free of any contact with the outside environment. The Albalact factory also has packaging systems for fresh products with special disinfection and sterile environment drying - systems which guarantee the quality of packed products. The yogurt production plant, for example, is equipped with a sterile air installation, in order to avoid the contamination of the product with germs. The air in the entire room is filtered and pumped through Hepa filters which eliminate all dust particles within the facility. There are also aseptic packaging systems for UHT (sterilized) products, in completely sterile facilities in the packaging area, with the package being sealed below liquid level - a system which guarantees the quality of the product for 4-6 months. Albalact has staff dedicated to developing new products and a laboratory equipped with advanced equipment for analysis and determination, complete with staff specialized in microbiology. At the Albalact factory, each production batch is analyzed and tested by the factory's laboratory specialists, both during the production flow and at the end of production, immediately after packaging. Albalact products do not leave the factory without the internal laboratory's approval. Albalact has been investing, year after year, in equipment upgrades and expanding the production capacities of its factories - the Albalact factory in Oiejdea, Alba and the Rarăul factory in Câmpulung Moldovenesc, Suceava.